1. Week Three of the NHL playoffs coincided with the start of the second round, and continued to feature some of the most intense hockey of the year. The Kings got another impressive effort from Jonathan Quick in their Game 1 victory over their Pacific Division rivals, San Jose. Quick turned aside 35 shots from the high-powered Sharks offense to preserve the victory. He was able to shut the door thanks to help from teammates like Rob Scuderi. 2. The President’s Trophy winners from Chicago greeted their Original Six rivals, the Red Wings, with a 4-1 win in Game 1 of their second round series. Marian Hossa, no stranger to playoff hockey, showed the impact of a quick release to open the scoring in this contest. 3. The Rangers-Bruins series kicked off with a closely contested battle in Boston. It was Nova Scotia’s Brad Marchand who played the hero, scoring the overtime winner on the Bruins’ 48th shot of the night. 4. In what was one of the tightest games of the playoffs thus far, the defending Stanley Cup champion Kings outlasted the Sharks, earning a 4-3 victory. The game featured big hits, timely saves and explosive shots. For those hockey fans on the east coast, these games are definitely worth staying up for. Check out this blast from San Jose defenceman Brad Stuart. 5. Penguins Captain Sidney Crosby led the way for Pittsburgh in Game 2 of their series against Ottawa, notching a hat-trick in a 4-3 Penguins victory. Crosby’s three goals gave him 100 career playoff points, and made him the fifth youngest player to ever hit this mark, behind only Wayne Gretzky, former teammate Mario Lemieux, Jari Kurri and Mike Bossy. Pretty good company. 6. Senators goalie Robin Lehner produced a Save of the Year candidate in that same game. The Pittsburgh crowd quickly went from jubilance to shock as Lehner slid across the crease to rob the Penguins on a 2-on-1 rush. 7. San Jose forward Logan Couture continued his impressive post-season, scoring the overtime winner just 1:29 into the extra frame of Game 3. Couture leads the Sharks with 10 points through their first seven playoff games, also leading the team in shooting percentage and, as documented, game-winning goals. 8. Boston rookie Torey Krug is quickly winning over the support of the Bruins faithful. The Livonia, Michigan native dazzled as he received a difficult pass before scoring the first goal in Game 2. NBC broadcaster Pierre McGuire was deeply delighted by this display of skill. 9. Elsewhere in the Eastern Conference that night, the Senators orchestrated a storybook ending for the home crowd, as Daniel Alfredsson tied the game at 1-1 with 29 seconds left, allowing St. John’s, Newfoundland native Colin Greening to score the double overtime winner. Naturally, goalies Craig Anderson and Tomas Vokoun were the second and third stars of the game respectively, given they turned aside 95 shots between them. It was the Ottawa fan favourite Greening who captured the game’s first star. 10. 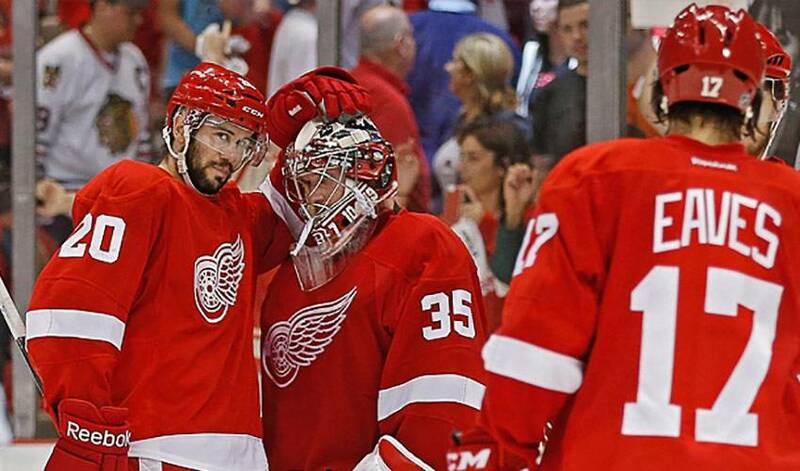 Detroit goalie Jimmy Howard continued to excite Red Wings fans Monday night at Joe Louis Arena. Howard, who led the league in shutouts during the regular season, turned aside 39 shots to help the Red Wings to a 3-1 victory.